One example is a CGI file that holds scripts that are responsible for sending email from a form on a website. These script files are often seen in a web server's "cgi-bin" directory. Since CGI files are text files, any text editor can be used to view and edit them. 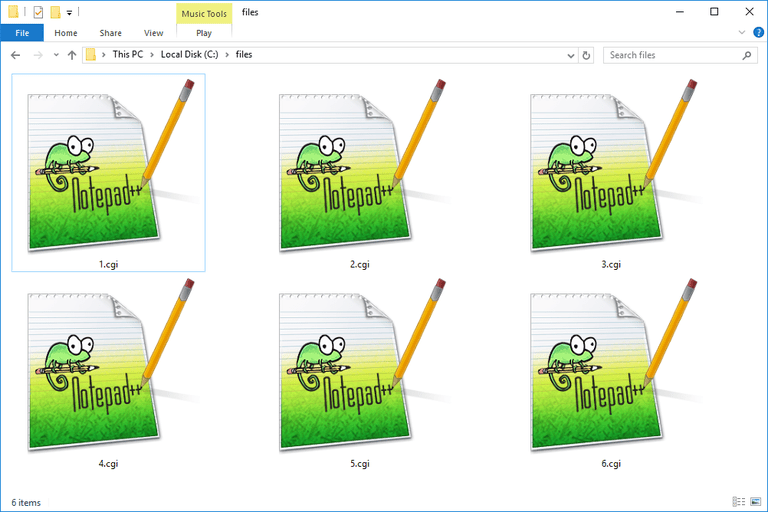 The built-in Notepad program in Windows can be used to open CGI files as well. Though it's not intended to work this way, you may sometimes try to download a file from a website but will instead get a .CGI file. For example, a bank statement or insurance bill you're downloading may come as a .CGI file instead of a PDF file (or some other format like JPG, etc.). You should be able to rename the .CGI file to the file you were intending to download, and then be able to open it like you regularly would. In this example, renaming the .CGI file to a .PDF file should let you open the PDF in a PDF viewer. The same process should work with any file in this context that's improperly named. Renaming files like this doesn't actually convert them to a new format. It just changes which program opens the file. Since in this example, the document should be a PDF, renaming it to .PDF is just putting the correct file extension on the file. If you keep getting a .CGI file instead of the actual file you're after, it may be necessary to clear the browser's cache and try again. Disabling your firewall or security software may be another solution if the problem persists. Still can't get your file to open? Double-check the file extension to make sure you aren't confusing a CGM (Computer Graphics Metafile), CSI, CGR (CATIA Graphical Representation), CGF (Crytek Geometry Format), or CGZ (Cube Map) file with a file that has the .CGI extension. If you find that an application on your PC does try to open the CGI file but it's the wrong application or if you would rather have another installed program open CGI files, change the default program for a specific file extension to make that change in Windows. CGI files won't work properly on a web server if you convert it to another format. However, you can still save an open CGI file to HTML or another text-based format using a text editor I linked to above. Remember what I said above about renaming a CGI file. Doing so doesn't actually convert the CGI to PDF, JPG, etc., but instead just puts the proper file extension on the file so that the right program will recognize and open it. An actual file conversion takes place with a file converter. It's beyond the scope of this article if what you're actually looking for is information on CGI programming. For example, if you want to translate information from a CGI form into an Excel file, you can't just convert the CGI script itself into an XLSX or XLS file.